2016 Update: I have redone this with a a new post “5 Pound Practical Ultralight Backpacking Gear List” which I believe is a far better approach to light on the AT. This new gear list is both light and practical. 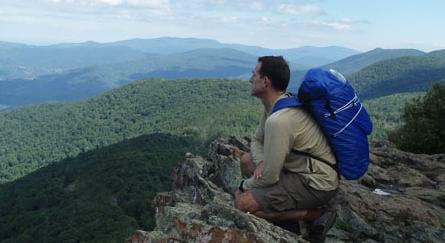 It can be used by many AT hikers to increase both their enjoyment and miles covered per day. 90+ mile Fall trip – AT in Shenandoah National Park – 3 days / 2 nights, Nighttime temps near 32 F with wind. One day/night of rain. Some key gear for 4.8 pounds FSO-BW: Jacks R Better Stealth Quilt (worn in poncho mode), Oware Cattarp 1.5 (cuben fiber version), Trail Designs Caldera cook system, Gossamer Gear 2007 Lightrek Poles (supporting the Cattarp), Inov-8 F-Lite 300 shoes, Gossamer Gear Whisper pack (blue), Rain Shield O2 Rain Jacket (yellow behind pack), and Smartwool Microweight Shirt. When I first thought of testing out a Sub-five-pound, Full Skin Out Base Weight (FSO-BW) gear kit I thought of early Fall in the Blue Ridge. To be a valid test, I’d need some good rain, some wind and cold nighttime temperatures. I’d need to watch the weather and be ready to quickly head out when the predicted forecast met these conditions. I’d also need to cover a lot of trail miles, at least 75 to 100 miles, to test out my gear. I chose the AT in the SNP because it is more mileage than I’d likely cover in three days and for its significance as a national trail. “AT trail miles” have become something of a national hiking standard. When possible, gear should be readily available, and reasonable in cost (reasonable for making a Sub-five-pound FSO-BW). * Using different criteria: Staying in huts and without cooking it would be possible to achieve a 1.9 pound base packweight (see gear list for more details) and under four pounds FSO-BW. Using the above criteria it was harder to get down to Sub-five-pound FSO-BW than I had anticipated. I quickly realized that my primary gear focus was on keeping warm and dry. To do that and stay under weight FSO-BW, I threw out many of the Ten “Essentials” and gear numerous people would consider essential. For instance: compass, knife, [sun hat, sunglasses, sunscreen]*, warm insulating jacket or vest, gloves, spare socks, long pants, TP, toothbrush/toothpaste, and no underwear. I even considered leaving my watch. On the trip I missed very little of this. The thing I wanted most was the down hood that mated with my JRB Stealth down quilt. (I would have traded my first aid kit and more for the hood.) I also missed dry camp socks at night. * I had a good summer base tan, only my face and hands were exposed, the leaves were on the trees so the trail was mostly shaded. Clothing and “gear carried” counts for a lot in FSO-BW. Usually, it is more than your BPW. To make sub 5 pounds, I selected the lightest garments I could get away with. Being a smaller person helps. Many times I went down a clothing size to reduce weight. This was my most important piece of gear. The Stealth Quilt is a lighter, sewn-through version of the No Sniveler Quilt. At $200 for a sub-one-pound sleep system with 800 fill power down, it is an ultralight bargain. The Stealth Quilt has a slit in the middle so it can be worn as an insulting poncho. Like Francis Capon in his CDT Yoyo, this quilt was both my “sleeping bag” and my sole insulating garment (Francis used a warmer version). Jacks R Better offers a down hood that integrates with both the Stealth and No Sniveler. The poncho/quilt system works quite well when you hike without stopping during the day. It eliminates about a pound to a half pound for an insulating garment like a down or synthetic high loft jacket. (In cold weather you hike fast enough to stay warm with a light wool shirt and a rain jacket.) In camp, you use the quilt briefly as a garment to stay warm while you cook and do chores morning and evening, otherwise you’re sleeping under it. My 15 oz Stealth quilt had 2 inches of average loft (single layer), ½ inch over the manufacturer specified 1 ½ inches of loft. It is rated to +45 °F. The first night was in the low 50’s and I slept quite warm under the JRB Stealth Quilt and easily dried out clothes wet from hiking in the rain. The second night on the trip was around 30 F, or about 10 to 15 degrees below the quilt’s rating. Due to the Stealth’s generous loft (for sub 16 oz bag), I managed to stay warm enough to get reasonable sleep. Note: One can use a conventional sleeping bag as an insulating garment. This involves wrapping the bag around your torso and neck and then covering it with an oversized shell jacket (e.g. a Rain Shield jacket a size larger than you normally wear) to hold it in place. It is the height of fall fashion and your buddies may laugh at you, but it works. This tarp, large enough for two-people in pinch, weighs 3.9 ounces! It uses a new lighter Cuben fabric. The large coverage has another weight savings. It allows a single hiker to use down bag without a bivy to protect it from rain that might blow under a smaller tarp. The Cuben Cattarp 1.5 while expensive for a tarp is still inexpensive compared to most UL tents. You get what you pay for. A tarp or shelter with the same coverage in Spinnaker fabric is almost double the weight. The Cattarp 1.5 measures 8.8 feet long x 7.1 feet wide at the front. It kept me dry with room to store gear and cook. I like the simplicity and ease of pitching a tarp. Most times I don’t cook on solo trips. But I thought that it would be more elegant to get under 5 pounds FSO-BW and still cook. In addition, I was doing a lot of trail miles and it is a big psychological boost to have hot food at the end of a 30+ mile day with thousands of feet of climbing. I like my hot cuppa (tea) in the morning and a warm meal and hot chocolate at night. The light weight and high fuel efficiency of the Caldera system is hard to beat. I took two ounces of alcohol fuel for the trip. Weight of the whole system including fuel bottle (less fuel) was well under 3 ounces. Image on the left is a lightened version of the TD stove system that I used (lower capacity and no priming ring stove, stripped down parts) that is not currently in production. Note: A version of this stove (right image), the Trail Designs Caldera Keg Cooking System is now available to the general public. New for 2007 is a stronger and stiffer tapered shaft that adds no weight to the poles. These are strong enough for anything trail hiking can dish out. They are also excellent tarp supports. At 2.4 ounces they are about ½ the weight of most aluminum and carbon trekking poles yet cost no more than many high quality poles. Another UL/XUL bargain. Note: Some will argue to skip the poles and just string the tarp between trees or use sticks for shelter support. I believe, like many long distance hikers, that trekking poles increase hiking efficiency. While I could have reduced my FSO-BWweight by leaving the poles, I believe it would have also reduced my daily mileage. The poles had two other significant advantages on the trip. (1) They clearly prevented me from slipping and falling when I hiked at night in pouring rain and whiteout conditions. (2) They were a godsend for a quick setup of my tarp in the rain that night. I was not in the mood, nor did I have the time, to ferret about in the dark for the right sticks to erect my shelter. I wanted to be under the tarp, in my warm quilt, and cooking dinner. Shoe weight matters. Even a conventional lightweight trail runner is too heavy for a sub 5 pound FSO-BW. The difficulty is finding a very light shoe that provides enough comfort and support to hike 30+ miles a day with no foot problems. The Inov-8 F-Lite 300’s are just over 10 ounces per shoe, provide excellent cushion (3 arrow mid-sole), and are easy on the feet. This summer alone, I’ve backpacked hundreds of miles in the magic combination of Inov-8 F-Lite 300 Shoes and Smartwool Adrenaline socks with no problems. This trip was no different. After 90+ miles in three days I had no blisters or serious foot discomfort. Probably the highest R value (insulating) pad for its weight, the Thinlight is surprisingly comfortable for the portion of your body it supports. The Thinlight does take up a bit of pack volume. In this case, that was a good thing as my Whisper pack was a bit over-volume for the small amount of gear I carried. I used a 3/8 inch thick pad trimmed to approximately 30 inches long and 16 to 12 inches wide. These were a new piece of gear for me. I was surprised at how well they worked. I have always taken GoLite Reed pants when there’s a good chance of rain. On this trip, I had on and off rain starting about noon on the first day and hard rain from late afternoon to when I stopped hiking around 10 PM. The rain was fairly warm (60’s), with dreadfully high humidity and whiteout conditions for most of the evening. The Spinn Chapps kept my legs just damp and I easily dried out under my quilt that night. I hadn’t used this jacket for a while but it was perfect for the trip. It is less than 5 ounces. The Propore fabric is highly breathable—almost as breathable as eVENT with the same flat moisture curve of a true microporous membrane (as opposed PU based technology including Gore-Tex). Breathability mattered since the Jacket would also be my windshirt. In a day of hiking in the rain (see Spinn Chapps) I arrived at camp just damp and I easily dried out under my quilt that night. The next two days had cold mornings (near freezing) and evenings and I used the Jacket as windshirt over my wool baselayer to stay warm when I hiked. I also used the Rain Shield Jacket as a pillow by stuffing it into its hood. It was my only bulky item left to make a pillow. Initially I considered taking a 3 oz GoLite C-Thru T-shirt. But with no insulating garment and no long pants, my shirt would be my sole warm piece of clothing when I hiked. From numerous years of experience with Smartwool shirts I know that in combination with a shell (in this case the Rain Shield Jacket) and a fleece balaclava, I can stay warm hiking down to the freezing (or even upper 20’s F if I keep moving fast). Do you still use that Oware tarp? Hi Cameron. Good Q. Answer is yes and no. Yes, I am still using a very similar Cuben (now DCF) tarps. But no, not the Oware. For ground sleeping I am using a Mountain Laurel Designs Grace Cuben (DCF) Duo tarp on 0.7 oz fabric. And for hammock camping I am using a Hammock Gear Hex (no doors) Cuben (DCF) tarp in 0.5 oz fabric. Both items are on my current gear lists 5 Pound Practical Lightweight Backpacking Gear List and 9 Pound Full Comfort Lightweight Backpacking Gear Checklist. Looking to purchase a Gossamer Gear Whisper Ultralight Pack or similar. I would appreciate an direction or leads on this you could give me. John, you might look a the HMG Stuff Pack. A MLD Core Pack (can be customized to save weight). Or possibly, a Gossamer Gear QuikSak 26 Adventure Pack.